This page: Cattle Brands and Branding. For discussion of Harry Heye Tammen, see Cody. 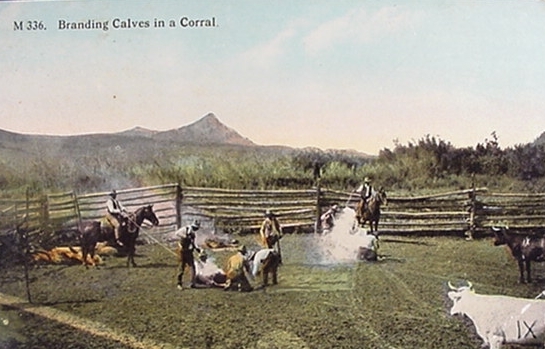 Branding in a corral involved first roping the calf, in some instances the corral would have a snubbing post to which the calf would be tied while stretched with a rope so the iron could be applied. Following the branding the calf would be "marked;" i. e. turned into a steer, and incidently producing Rocky Mountain oysters. The practice of branding has been traced back to ancient Egypt. It was brought to North America by the Spanish. In Mexico brands could be quite elaborate. In the United States brands are composed of letters, squares, diamonds, slashes, bars, and other symbols, all in different compositions and placements. Business Card, Theodore Roosevelt's Concord Cattle Company, illustrating Roosevelt's "Maltese Cross" and "Elk Horn" brands. Cowboys might be a little irreverent about the brands. Thus, the second Lazy Em Bar was sometime referred to as the "Buzzard on a Rail." See also the "Turkey Track" below. One might begin to "decorate" the letters or numbers. By adding a roof to the letter J, we get the Rafter J, or by adding the roof to the number eleven, we get one of Addison Spaugh's brands, the Rafter 11. See also the Rafter I below. One might add one or two "wings" to a letter, as in the example of the "Flying P" above, or the "Flying O" below, or the "Flying V" toward the bottom of the page. By the addition of a quarter circle to the bottom of a letter is is referred to as "rocking," as in the famous "Rocking R" below. Other variations can be made. A letter with legs is referred to as "walking." A letter which is tilted is "tumbling." 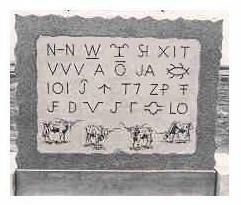 Pictographs can also be used such as the "Bug," discussed below, Theodore Roosevelt's Elk Horn, or the Hashknife above. Although, many brands are left to right as in the case of the N Bar N and the H Bar Open A, above, other configurations are possible such a hanging a letter off of another as in the instance of the Lazy J Hanging T above. As a result, literally thousands of combinations are possible, thus, requiring Brand Books, such as depicted to the right. The early Spanish introduced cattle into Mexico. By 1537 it became necessary to establish a central registry in Mexico City in which all brands were to be listed. The practice of branding and the practice of registering the brands followed the Spanish into Texas. In the English Colonies cattle were identified by ear marks. Thus, on Long Island, registrations of ear marks are to be found as early as 1707. In upstate New York in the Town of New Windsor, various ear marks were recorded by Thomas Woodhull, Joseph Wilken, Thurston Wood, and Henry Still. Thus, Wilken's mark, recorded on May 15, 1807, for cattle was noted as "a slit in the left ear and a half penny on the underside of the right ear." Registrations are required to be renewed in years ending in 5, i. e. 1995, 2005, etc. 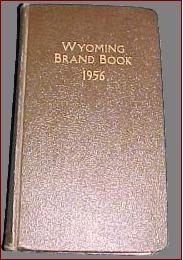 With approximately 28,000 brands in Wyoming books showing the various brands are a necessity. Brand Books are issued every ten years with periodic supplements. The books show first, a picture of the brand, secondly, a diagram of any ear marks, and the name and address of the owner of the brand. In some states, such as California and Nebraska, the brand book may be accessed on the Internet. First Row: "N Bar N," Wm. F. Niedringhaus and Frederick W. Niedringhaus, Panhandle City, Tex. 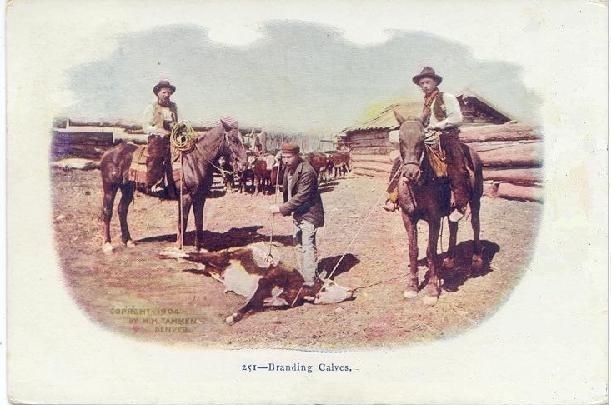 ; W Bar, Pierre Wibaux, Wibaux Montana; "Hashknife," J. R. Couts and John N. Simpson, Abilene, Texas; "S H," Northern Cattle Company, Little Powder River, Mont. ; "X I T," Capitol Freehold and Investment Company. Second Row: "Three V's," Western Ranches, Ltd, on the Belle Fource; the "A;" the "Bar O," J. W. Sacra, E. C. Suggs and J. W. Suggs, Salt Fork of the Red River; the "J A," Charles Goodnight, Palo Duro Canyon, Texas; the "Bug," Montana. Third Row: "101," Standard Cattle Company, Moorcroft and Fallen County, Mt. ; "Half Circle J," Clay County, Texas;" "Turkey Track" (sometimes referred to as the "Rafter I"), Hansford Land and Cattle Company; "T 7," Campbell County, Wyo. ; Unidentified; Unidentified. The Hashknife, started in Texas and had properties in Arizona and Montana. 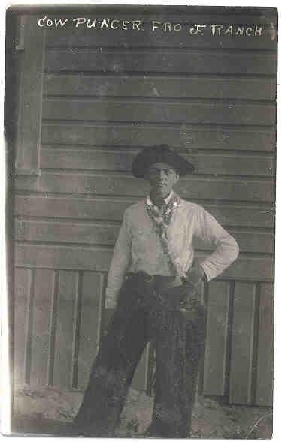 The "Hashknife Outfit" noted by Zane Grey was owned by the Aztec Cattle Company in Arizona. A hashknife was an implement frequently found on a chuckwagon. The J A bears the initials of John Adair, Charles Goodnight's financial backer in the J A. Goodnight also used a circle as a trail brand. While brands were typically placed on the hip, trail brands were often placed on the left side. Additionally, brands might be placed on the jaw. Original brands, when the animal was sold, might be vented (crossed off) and the new owner's brand placed nearby. The animal would also bear various knife cuts on ears, wattles, and dewlaps, to assist in identification. Thus, a brand book carried on a roundup would include notations both as to brands, but locations and earmarks. The X I T was formed when the old Texas State Capitol Building burned. The estimated cost of one and half million dollars was raised by the sale of state lands in the Panhandle of Texas to a the Texas Ranch Capital Syndicate, which in turn raised money in Britain from the Capitol Freehold and Investment Company. With cost overruns the new capitol cost in excess of $3,000,000. Ultimately, the Company had over 3,000,000 acres in Texas and Montana. Over an 11 year period 12,500 cattle were trailed annually to Montana and South Dakota. After 1900 the Company began to liquidate. The last of its cattle were sold in 1912, but it took until 1963 to dispose of the last of its land holdings. Although it is a popular old wives' tale that the brand stood for "Ten in Texas" as a result of the ranch spreading over ten counties, it was probably designed for ease of application with a running iron and difficulty of modification. It's brands were registered in five states. Thus, it was not necessary to have a road brand. 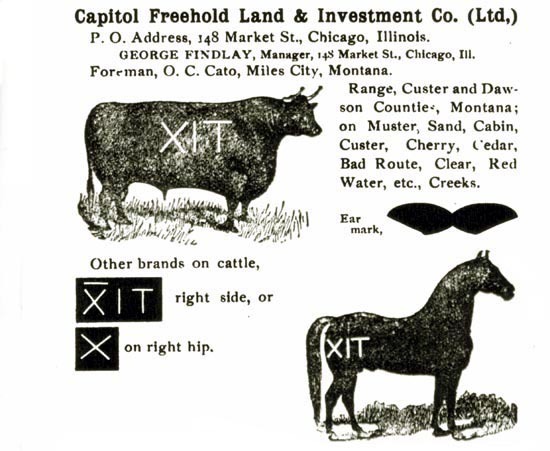 XIT brands as registered in Montana, 1903. The "Blocker 7," pictured to the left, was a "road brand" used by John Rufus Blocker (1851-1927), a contract drover who, with his brother Abner "Ab" Pickens Blocker (1856-1943), trailed cattle for a thirty-year period, 1873-1903, to Colorado, Dakota Territory, and Wyoming. The Potter-Blocker Trail, from Albany, Texas to Cheyenne, is named after Jack Potter and Abner Blocker. The trail was laid out by Potter after he was diverted from crossing Charles Goodnight's J A by the imposition of the "Winchester Quarantine" by Goodnight. Abner is credited with the design of the X I T brand. The Blocker Brothers last major drive was of 9,000 head to Deadwood, S. Dak. in 1893. Many stockgrowers would have multiple brands. The Two Bar had so many, the foremen actually had to carry a brand book around with them to indentify the Company's own cattle. See Two Bar brands to the right. The Three V's was owned by Western Ranches, Ltd., located on the Belle Fourche. Today, the Company is noted as the ranch from whom the Sundance Kid stole a horse. The 101 was a brand used by the Standard Cattle Company which had properties near Moorcroft and Custer County, Montana as well as Nebraska. The brand was also used by Miller's Hundred and One, near Guthrie, Oklahoma. The Turkey Track, sometimes also referred to as the "Rafter I," was owned by the Hansford Land and Cattle Company which acquired the brand in 1883. It was a Scottish-owned company with its headquarters at Number 3 India building, Dundee. By 1890, the company owned some 85,000 acres and leased another 350,000 acres. At the time, it had an average cattle count of 30,000 head. The Hansford Land and Cattle Company began to sell out in 1900 and ceased operations in 1916. The brand is, however, still in use. The Flying V was a brand used by the Matador, a British owned outfit, which had interests from Texas to Saskatchewan, although the brand was usually made as shown to the left. The Flying V was also used by ranches in Oklahoma, Kansas and Wyoming. Therefore, brand books would make distinctions based on the location of the brand on the left, right, etc. Some brand books would also contain maps showing the normal range for a particular brand. I gazed at the stars in the sky. Who are noted and know every brand. Is narrow and dim so they say. Is staked out and blazed all the way. "I'm ready to be driven away." For He knows every action and look. And have your name in the old valley book. Next page: Chugwater and the Swan Land and Cattle Company.